When it’s time to pack up and head out to the beach, you grab your stuff and go, right? But what stuff do you grab? DO you have a bag made up that is ready and waiting for you to trot off for a day of fun in the sun and water? I keep a bag that is ready to go, packed and on our storage rack, so that it is just a ‘grab-n’-go situation! After all who wants to hesitate to join in on the fun at the beach? 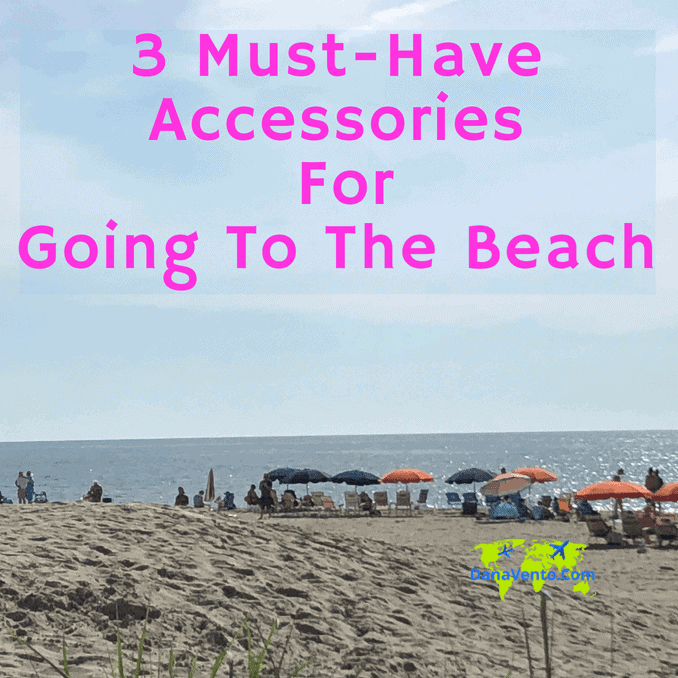 Keep things simple, organized and ready for action by packing a bag ahead with 3 must-have accessories for going to the beach. Personally, there are just a few things I can not do without and bright sunny beach days are important to health and wellness. Getting out and getting away even if just for a few hours is super and leaves me feeling refreshed and ready to conquer my daily grind! 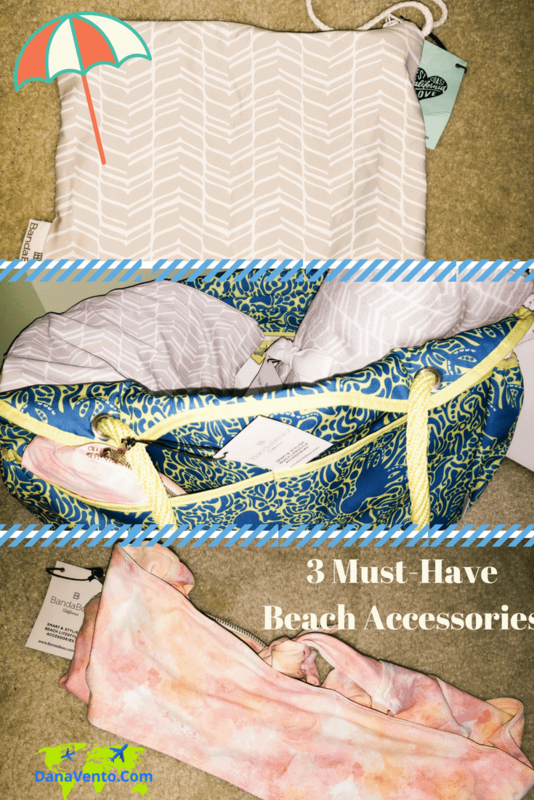 Lavishly live travel to the beach out loud, and check out what I tote when I go to the beach! Have you ever used pool towels that are less than appointed well? I mean, they cover only part of the chair and not the rest? Let’s just say that is totally annoying and there is no way that it is fashionably acceptable. It’s like getting out of the shower using a foot mat for drying off, there’s no coverage. Why would you take a great day and destroy it with a mini towel? Just stop the madness, and get fashionable and covered! Bigger is better, and here is the truth about short towels! Don’t use shrunk, small towels, get your fashionable beach towels out that cover the entire chair. Oh, if you don’t know where to find one, let me share! Bandabeau’s lounge chair-length beach towel features a plush 100% cotton top for soaking up the sun in comfort! That’s right, it’s not only super absorbent for drying off post-swim but it is super-sized to cover your chair! You deserve to sunbathe like a VIP and this luxurious double-sided beauty is 90” inches long, so it will fully cover a chaise lounger. Goodbye to the days of needing two beach towels to cover your chair! Fashionable luxury for those fun in the sun days! So while I love being poolside or on the beach, the wind can drive me crazy. I just get my towel set up and comfortable and if I move away, my towel moves. You gotta be kidding me? Now I have to start all over again. We all have seen this act played out by most around pools, on the beach chairs, etc. What a total crimp in relaxation. Rather than shuffle around over and over again, get the towel around your chair the first time and then add this! Both fashionable and functional is how to best describe the Towel Tamer by BandaBeau. Plus as an added bonus you can store stuff in this. What exactly is the Towel Tamer fashion statement? The towel-taming, seat-saving, stuff-storing solution is the ultimate beachfront and poolside essential. It resembles a bandeau bikini-inspired towel band which wraps around the top of a lounge chair to keep wind-blown beach towels in place. (I can only imagine someone took off their bandeau to sun and this was born, maybe? That’s how I wish I would have thought of this! Truly, it’s fully adjustable and made from a stretchable, swimsuit fabric. Better yet, no need to settle for a one color fits all because it comes in a variety of vibrant prints. Not only will your pool or beach char stand out, but when poolside it saves your pool cause you got ‘towel-saving’ privileges! BOOM! #Winning. The last and most important item to mention is that it offers a hidden zippered pocket. Truly this is the perfect place for stashing small valuables! To make packing it up and taking it with you easy, it converts to a travel pouch! That’s right it is compact enough to tote in a beach bag or pack in a carry-on! Since your day is done poolside or beachside, it’s time to pack it up and get back home. How are you going to transport your wet suit? Oh, that’s right, you are going to wrap it up in your towel, forget about it, and then it will smell. Then, when you just dump a whole load of towels into the wash, you will also place that towel in, forgetting your FAVORITE swimsuit is in there. The nightmare begins, you wash your swimsuit rather than handwash it and it’s destroyed. Goodbye favorite suit or was there a better way? Of course, there is! BandaBeau knocks this out of the ballpark (changing room, cabana, whatever!). Keep your fashionable swimsuit, fashionable, and elevate your beachfront and poolside style. Use the waterproof and antimicrobial swimsuit bags are a fashionable solution for separating wet clothes and keeping them mildew and smell-free. The stylish, water-absorbent exterior is made from the same fast-drying swimsuit fabric as their towel tamers (above). Better yet, it comes in a variety of coordinating beach-inspired prints. A versatile and convenient travel bag is designed to tote soggy swimsuits, wet flip flops or sweaty gym clothes. Further, it also doubles as a beach pillow when filled with a tee, tank, sarong, etc. Includes a convenient drawstring wrist strap for carrying with ease. wow.you share very nice accessories. it is very nice to visit your site.thanks for sharing it. I tried the towel tamer and though originally I feared it would be one of those impulse buys that I never used, it turned out to be one of the greatest purchases! It has found a permanent home in my beach bag. Adding to your list of items in my grab and go to the beach bag has to be sunscreen, my mini beach pillow, flip glops and of my beloved sarong.